Pierre & Vacances Résidence Estepona in Estepona - the best offers! This price applies to 2-person apartment Studio Standard, with the arrival as 29 April 2019, 2 Nights. 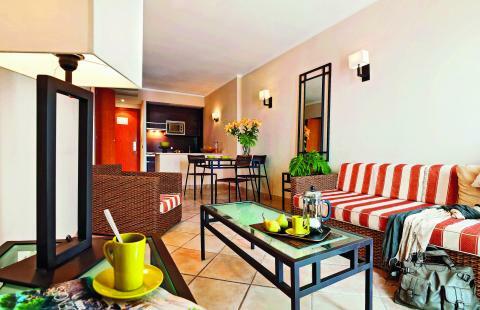 This price applies to 4-person apartment Standard, with the arrival as 27 April 2019, 2 Nights. 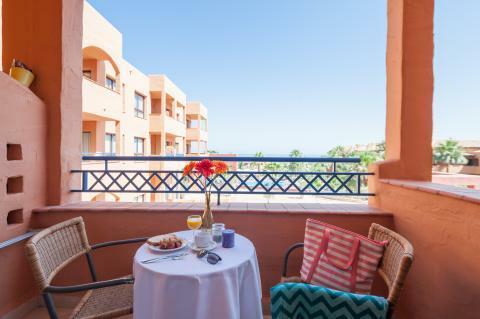 This price applies to 4-person apartment Sea View Standard, with the arrival as 1 July 2019, 2 Nights. Pierre & Vacances Résidence Estepona is located in the middle of nature with a large swimming pool. The resort is located at the end of the Costa del Sol and welcomes you to a relaxing holiday only 2.5km north of the beach. Feel free to spend the whole day cooling down in the 600m² pool. Along the pool there are also deck chairs with parasols where you can relax completely; they’re also the perfect place to chill with a book. If you’re in the mood for being a bit more active, then there’s several golf courses, both 9- and 18-hole, in the local area, all within 12km reach. In the resort, there is an outdoor playground for the children and a play area at the reception, where you can also find video games for the slightly older children and teens. During the summer holidays in July and August, there is also a activities club for children from 4 to 11 years old, and a paddling pool so that the little ones can swim and splash around. There’s even a horse riding centre located a mere 6km away, the perfect day out for any children who love horses! For a delicious dinner, visit the Caledonia Restaurant at Pierre & Vacances Résidence Estepona and enjoy traditional Mediterranean specialities. When the weather is especially good you can dine on the restaurant's outdoor terrace which overlooks the garden. In July and August, you can also enjoy an afternoon snack from the snack bar. If going out in the evening is more your kind of thing, there are also two bars where you can enjoy delightful cocktails. A bread and pastry delivery service is also available every morning when ordered at reception the night before. Visit the beach (2.5km) and enjoy the sun while the children build sand castles, and then go and check out the town of Estepona to do a little bit of shopping. In the immediate vicinity of the resort, there are plenty of things that you can do. Would you like to play golf? The Flamingos Golf Course is about 1.6km from the resort. Want to play tennis? Visit the tennis court at Club Bel Air, only 1.5 km away. You could also visit the beautiful old town of Marbella (18km), 25 minutes by car from the resort and offers impressive renaissance buildings. The port of Estepona also invites you to admire its beautiful boats, cosy bars, restaurants and a small market with a wonderful atmosphere – roughly 16km away from the holiday park. The park requires a deposit of € 200 - € 500 per accommodation.